We become members of this new family by “being born of water and Spirit” (John 3:5). And we grow in this new family of God by joining with all “those who hear the word of God and act on it” (Luke 8:21). Too many people think it is enough to conquer sin by their own willpower. The life of faith is never about what we can do. God always takes the first step, and then we “hear the word of God and act on it” (Luke 8:21). The Blessed Virgin Mary shows us the way. 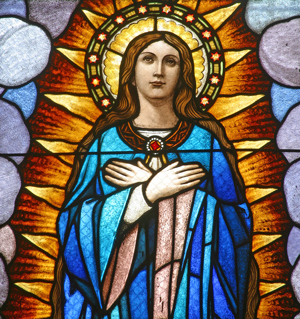 She was the first in the New Testament to “hear the word of God” that she would “conceive in her womb and bear a son, and name him Jesus” (Luke 1:31). Mary “acted on it” with the most important words ever spoken by a human: “May it be done to me according to your word” (Luke 1:38).